We have three games for you this week. So let's get the ball rolling. First up is Super Cup Finals. 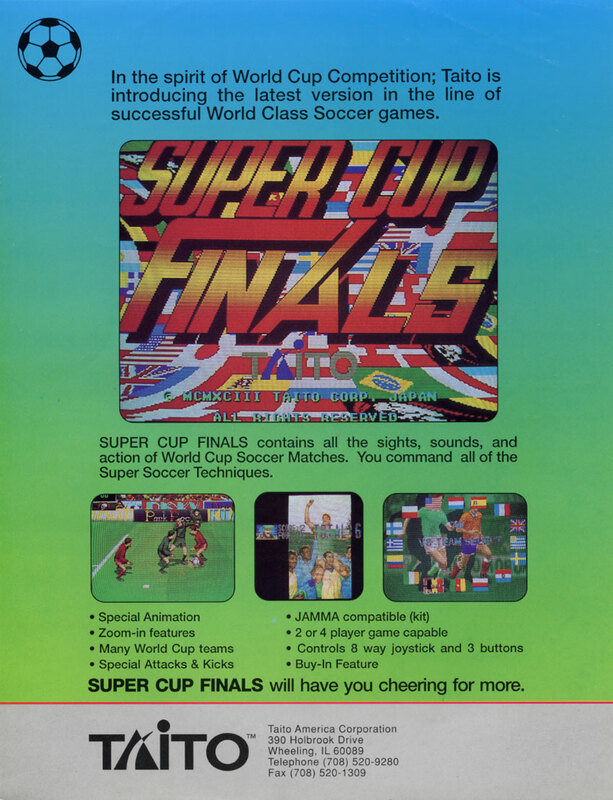 Super Cup Finals is brought to us by Tatio in 1993. This is a football (soccer) game, when you start up you have to choose one of eight members to represent yourself. After you have chosen a member you then must pick a team you have twenty four to choose from. Once the match starts you have 90 seconds to out score the other team. At the start of the match and during some other points during the match you will be prompted to press a button. This will pop up a dialog box in which you can spend points on skills like super dash and super slide the cost of the skills range from 1 to 6 points. You only start with two points you are able to trade credits for more points though you will get three points for each credit. If you draw a match it will cost you a credit to continue. If you choose to continue you will be given the option to play a normal game again or to play a penalty kick phase. The penalty kick phase is 5 rounds long in which you take turns shooting/defending the goal. If you draw in this phase it goes to sudden death and the first to score with the other failing wins. If you lose the penalty kick phase you can only continue as a normal game. 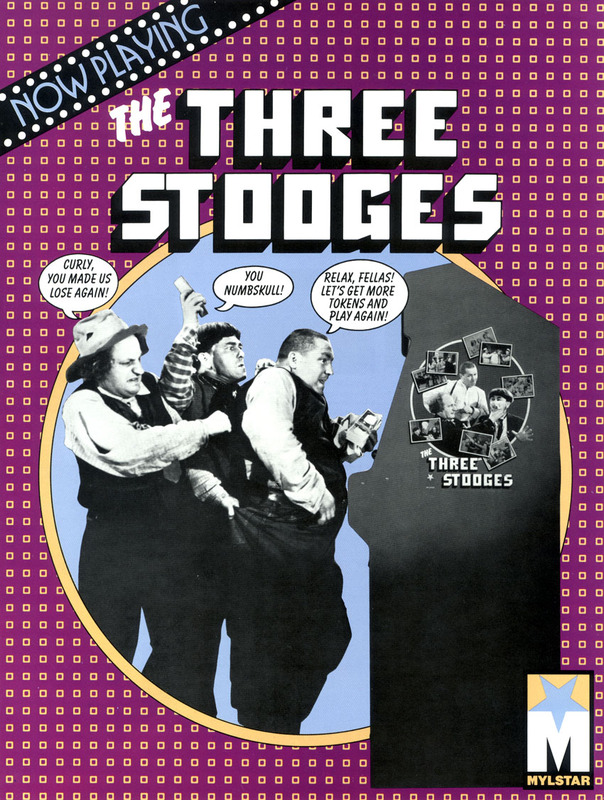 The second game this week is The Three Stooges in Brides is Brides. 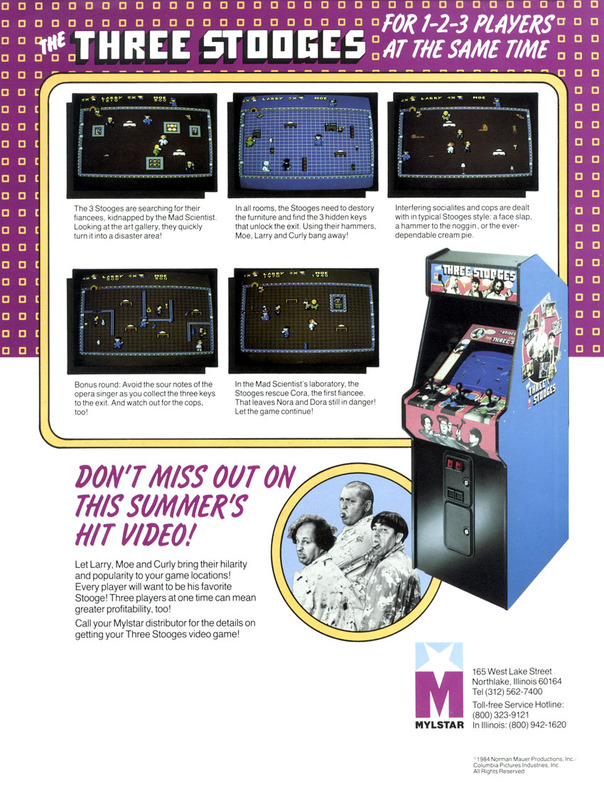 The Three Stooges was developed and published by Mylstar Electronics and released in 1984. In this game you can control either Moe, Larry or Curly in your quest to rescue your brides to be there names are Cora, Nora and Dora. The brides were kidnapped by a mad scientist I.M.Acad M.D. There are seven stages and they are in order The Office, The Parlor, The Kitchen, The Singers, The Art Gallery, The Police Station and last The Laboratory. In order to progress through the stages you need to find three keys. Once all the keys are found an exit will open up for you. These keys are hiding in furniture scattered around the stage which needs to be destroyed. To destroy the furniture to get to the keys you need a hammer which you can pick up off the ground or slap someone that has the hammer. The game can be played with three players but in single player mode the other characters are computer controlled and will hit you with pies and the hammers. Pies/slaps will stun everyone including you for a short time and will also make the hammer drop if they are holding one. The hammers will knock out the enemy but if you are hit with a hammer you will lose a life. 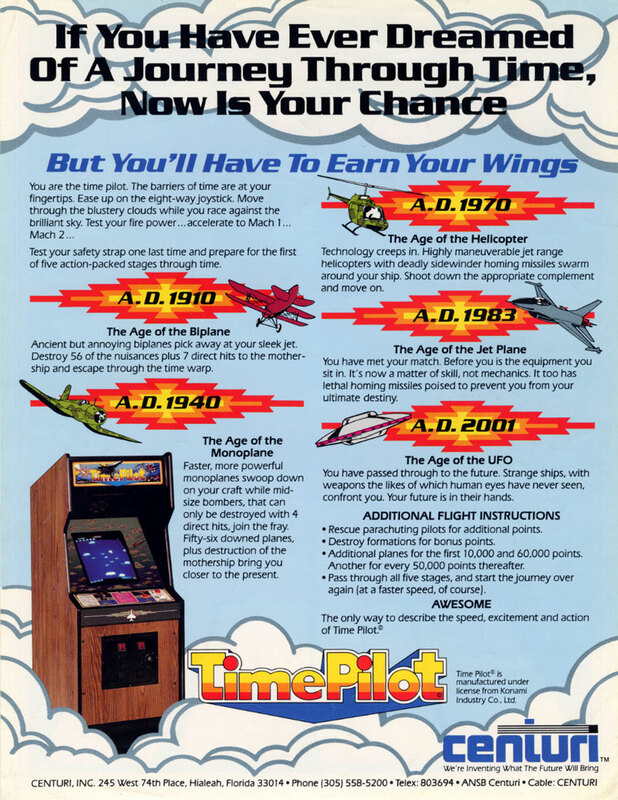 The last game of the week is Time Pilot. 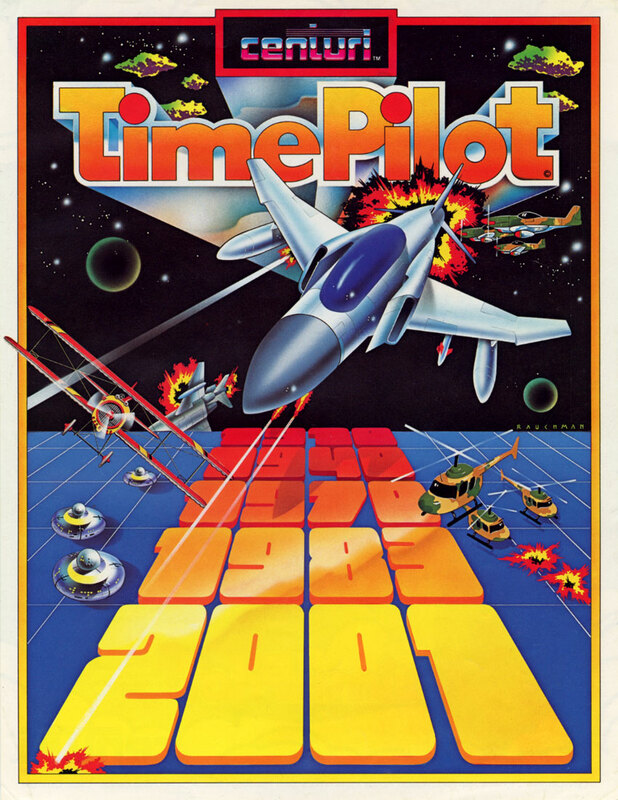 Time Pilot was developed by Konami and published by Centuri in the US and was released in the year 1982. You are a time traveler fighter pilot, fighting your way through the past back to the present and into the future. The game has five different stages set in the years 1910, 1940, 1970, 1982 (1983 in the Centuri version) and 2001. To pass each stage you need to destroy a set amount of enemy aircraft which will then make the mothership of the stage show up which you need to destroy. After destroying the mothership you will time travel to the next stage. After you have completed the first five stages you are sent back to 1910 for stage six which is now harder and faster.